Among other celebrations during this month, October is also a national computer learning month. 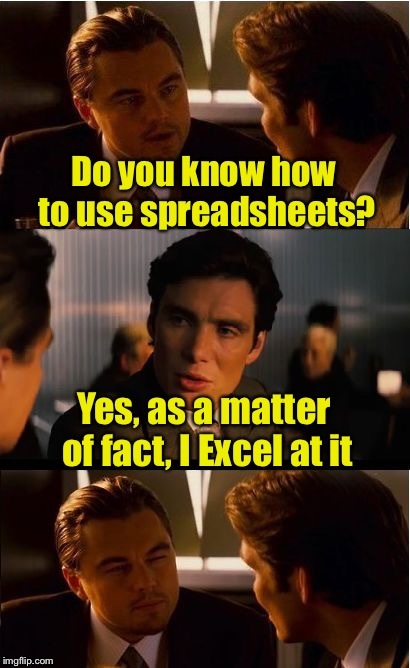 additionally, Oct. 17 is national spreadsheet day, compounding the desire for people everywhere to brush up on their Excel skills, share their knowledge and gain some new tricks. Excel has become synonymous with spreadsheets and is still the program of choice for working with them. Becoming proficient in Excel can increase salary, productivity and save hours of time with the use of functions, short-cuts, and programming. The tips in this article can help you become a spreadsheet ninja in Excel and impress your boss and coworkers. Move to last cell on worksheet. Inserts a new column or row. Places border around selected cells. Creates a formula to sum all of the above cells. Selects the current region around the active cell. Selects all cells referenced by formulas in the highlighted section. Selects cells that contain formulas that reference the active cell. Selects the cells within a column that don’t match the formula or static value in the active cell. Selects all of the cells that contain comments. Wrangling and manipulating data in excel can seem intimidating, especially when the numbers of rows and columns begin to approach the five and six digit mark. At these points, dragging and scrolling become fairly useless, but this is where keyboard shortcuts shine. Some of these are probably refreshers for many readers but they are none the less powerful. Try them out and you will quickly discover how these commands can be used and chained together to order and arrange data in Excel no matter how large or small it may be. Creates a chart from selected data. Fill down. Fills the cell beneath with the contents of the selected cell. Go to a certain area. Spell check selected text or document. While these only scratch the surface of what excel can do they do help in speeding up the process of getting there. Excel still holds all the power found in PivotTables, Formulas and the programming power of VBA. The lastest Excel 2019 has even more functions and features like map and funnel charts, SVG visuals and the ability to publish to Power BI. Enhancing your Excel ninja skills will still take time. But, the more time and practice you devote to it will pay off, and pay you more salary hopefully. Be sure to check out the latest version of excel at MyChoiceSoftware and test out these shortcuts. If we missed your favorite one leave it in the comments below to help others in there computer learning for October and throughout the year. Check with your library. Get a card. I’m in Thurston county, WA. This gives you access to Lynda.com that has all the training for any class you want. I’m doing Excel now. All free. Bring back Data Table 2!